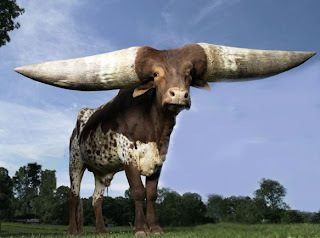 Lurch, the local "Guinness World Records" African Watusi steer who gained world acclaim in 2003 because of the size of his enormous horns, has died. Lurch was 14 years old. At the time of his induction into the record book, Lurch's horns measured a circumference of 95.25 cm. or 37.5 inches—the world's largest. And they were still growing. Born in 1995, Lurch came to live at Rocky Ridge Refuge in Gassville, Arkansas when he was only five weeks old. He shared 15 acres that Wolf inherited from her father, with a number of other animals, under the care of refuge creator, Janis Wolf who relies on donations and volunteers for the care and feeding of all her animals. Lurch made the national television spotlight when he and his friends were highlighted on the Ellen DeGeneres show a couple years ago. Donations helped build a new barn and feed for the animals. Wolf, who holds a masters degree in human rehabilitation and experience as a veterinary technician, is the sole caregiver to as many animals as happen to turn up at her place. She has devoted everything she has to her animals which, include a water buffalo, zebra, llamas, sheep, goats, countless dogs, cats, baby deer, raccoons, and all other kinds of critters. She has animals who have gone blind, become crippled, or just don't have a home. There are plenty of dogs and cats to be adopted as well. Wolf has lost a special friend with the loss of Lurch.